This is Hyundai’s new small crossover before you’re supposed to see it. We already know Hyundai is going to debut the all-new 2020 Sonata at the New York Auto Show this month. The Korean automaker has released photos of the redesigned sedan, with more details to be revealed when it debuts. This isn’t the only Hyundai model that will be unveiled at the Big Apple, however. Last week, Hyundai teased a new model called the Venue, a new entry-level crossover that will slot below the Kona and rival the Nissan Kicks. So far, Hyundai has only shown a close-up of its new baby crossover’s rear, but we now have a better idea what it looks like thanks to leaked photos posted by CarDheko. The photos show a local market variant in the range-topping SX trim spotted at a dealer stockyard in India. 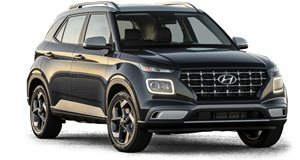 At the front, the Venue takes its cues from the Kona, with slender headlights and LED daytime running lights integrated into the front bumper, as well as Hyundai’s cascading grille and copious amounts of chrome. The range-topping variant spied in the photos rides on 16-inch dual-tone alloy wheels. The Turbo badge on the back suggests the Venue is powered by Hyundai’s turbocharged 1.0-liter, three-cylinder gasoline engine, which is expected to be available with both a manual and dual-clutch automatic transmission in some markets. We also get a look inside the Venue, which features a large touchscreen display and a three-spoke, leather-wrapped steering wheel. While other Hyundai crossovers have been named after a city or place, Hyundai says the Venue "references a 'place' where people want to be seen." 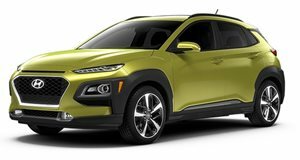 Pricing will likely start at under $20,000 since the Venue is positioned below the Kona, but we'll find out more when Hyundai's new baby crossover makes its world debut at the New York Auto Show on April 17.